I’ve talked on these blog many times about the importance of setting goals. Without both types of goals, you run the risk of maximizing end goals at the expense of meeting process goals. For instance, you might maximize revenue by having a sale that packs in buyers, but causes a lot of dissatisfaction because your staff can’t handle the customers effectively. Think Black Friday — is it really worth it to have people waiting in long lines to buy your deep discounts? Does it eliminate buyers willing to pay full price for items that aren’t discounted? Does it create a poor image or reduce satisfaction for your brand that reduces your future sales? If you’ve ever been part of a sports team, you have a great example showing how important process goals are for your success. As a basketball player, you didn’t just learn to make shots go in the basket. You practices passing, dribbling, and other aspects of the game. You also worked with weights to increase your distance, ran to increase your speed and stamina, and used other types of training off the court. Football players sometimes even take ballet class to learn those great moves allowing them to evade tackles. Sit down with your team to list all the activities leading to success. Now, what customer actions lead to those activities? Most firms have no problem developing KPIs for end goals – things like sales revenue, ROI, and AOV are obvious and easily measured. Process goals don’t get measured as often and are harder to map to end goals, so some firms have trouble developing KPIs for process goals. Instead, these firms focus on what’s easy to measure, even if these metrics don’t map to firm success. That’s why you see firms measuring #Fans/ Followers on social networks. Not because they matter much, just because they’re easy to measure. Don’t fall for that trick. Instead develop KPIs for your process goals. 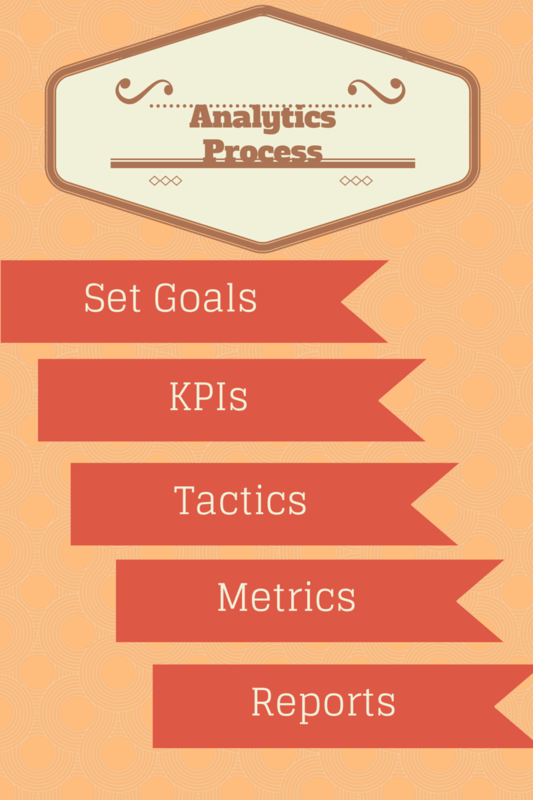 Using you list of process goals makes developing a list of KPIs is much easier. Since we know satisfied customers not only buy more from us, but recommend our brand more frequently, your KPIs should include satisfaction. To help think of more, I have a list of KPIs on Listly and you’re welcome to add to my list. Look at my list of KPIs and determine which ones map to your list of process goals. Can you think of additional KPIs that map to your process goals? With your KPIs firmly established, now you’re ready to develop tactics that improve your KPI metrics. For instance, one of your KPIs is likely share of voice — a really important KPI in social media because it reflects how much your brand shows up in organic search versus your competition. You want to increase your share of voice. One tactic to do that is choosing better keywords and increasing your SERPs. With Google’s new algorithm, content marketing is the fastest way to increase SERPs or you can choose another tactic representing high-impact factors from Google’s search algorithm, like getting more social shares (which may also rely on content marketing to an extent. You’ve probably heard the saying: “What gets managed, gets improved“. [Tweet “What gets managed, gets improved http://ow.ly/CAc1s”]But, if you don’t have a system of metrics reflecting what really matters, you’ll be easily overwhelmed with data and not have the tools to improve anything. Or, you’ll simply throw up your hands and ignore everything, since you can’t make sense of any of it. With all the work you’ve already done, developing metrics is much easier and those metrics truly reflect numbers showing how successful you are. Instead of literally thousands of pieces of data available, most of it meaningless, you now pay attention to a fraction of data that maps directly or indirectly to your success. Now, monitoring these metrics suggests actions to improve performance — and that’s the name of the game, isn’t it? Map your KPIs to individual metrics. So, share of voice metrics include your position in organic search. You can get this metric from your webmaster tools and they might look something like this table. Or use a tool like Webposition to rank your site, as well as competitor sites on each keyword. You’ll also need CTR (click through rate), which you’ll also find in webmaster tools. Export everything to a spreadsheet, then calculate your share of voice using results from both your websites and those of competitors. For detailed instructions, check this out. Don’t forget to add metrics reflecting how well your tactics are working. So, if your tactic was to increase the social engagement your content, then add elements of social engagement (likes, shares, comments) that amplify your content, along with the CTR from each social platform — from Google Analytics. Gathering a bunch of metrics, even if they’re the right metrics, doesn’t really improve your market performance. So, the last step in the analytics process is to generate reports that not only contain metrics, but make suggestions for improvement based on these metrics. So, if your social referrals is too low, research whether your social engagement is too low or the CTR from each social platform is too low. Reports are your chance to analyze metrics to determine the most appropriate course of action — one that will improve your market performance the most. In the example above, if the CTR is too low, look at characteristics of post with the highest CTR. What did they have in common? Can you create future posts sharing this characteristic? I have a client whose CTR from Facebook promoted posts varies widely. Posts with the highest CRT, aren’t usually the ones with the highest number of likes. Posts that generate a higher CTR seem to share the characteristic that they don’t contain an image. Now, all the gurus (see Social Media Examiner, for instance) will tell you posts with images perform better (by a large amount) than posts without them, but for this particular clients, that’s not the case. Don’t skimp on the reporting end of the analytics process. That’s like doing all the word to get your basketball team to the state tournament, then deciding to skip the game because the bus trip was too long. Whether you need a content marketing strategy or a complete metrics-driven social media strategy, we can fill your digital marketing funnel. We can help you do your own social media marketing better or do it for you with our community managers, strategists, and account executives. We’ll even help you create a successful start-up. You can request a FREE introductory meeting or sign up for my email newsletter to learn more about social media marketing. Also, think about contributing to a future edition of Analytics in Action. You can see my guidelines and even submit your contribution online here. I’d love to hear how analytics are helping your business.